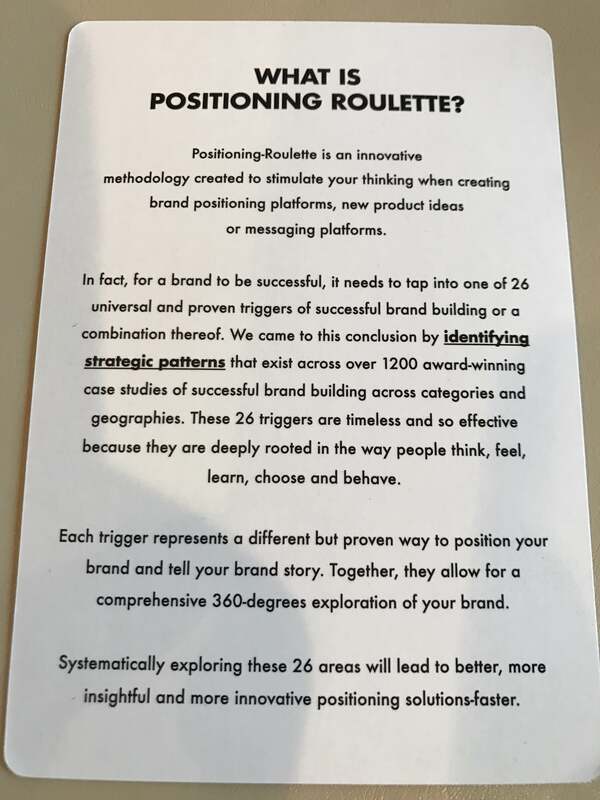 The Positioning-Roulette flashcards are a best-seller designed to stimulate and inspire your thinking when developing brand positioning platforms, brand positioning statements, value propositions. Using the cards will lead to more relevant solutions, faster, by inspiring you to look at your brand or product from 26 fresh, proven and rigorously validated perspectives. The cards are also a great tool to generate new product ideas. The deck consists of 26 cards, each featuring a different, proven successful strategy to position a brand or tell a brand story. 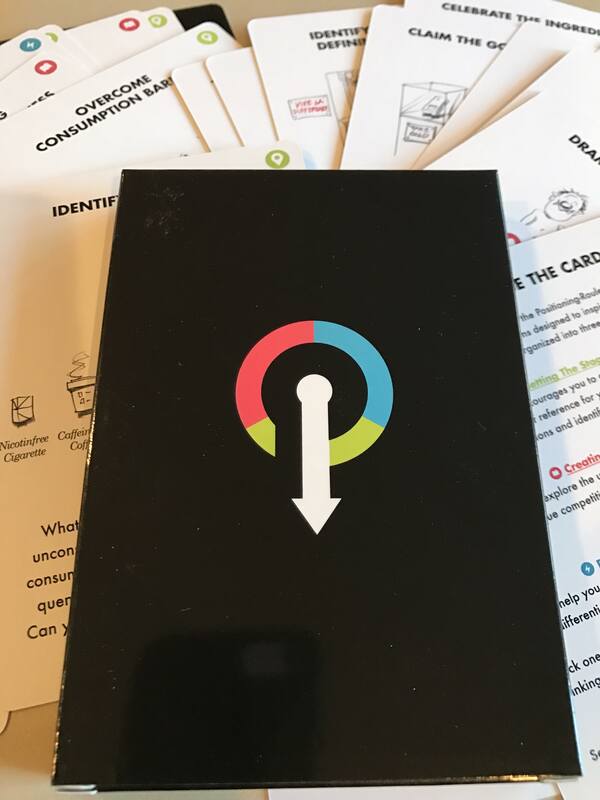 Each card describes one of the 26 principles and includes a series of questions to inspire the user’s creative ideation process. They can be used by an individual trying to look at a problem from different perspectives or by a group as a workshop ideation tool and creative problem-solving tool. The 26 “approaches” were identified by analyzing over 1200 case studies of successful brand building (Effies, etc.). They are so effective and powerful because they are rooted in the way people think, feel, learn, do, choose, and behave. The cards will help you identify fresh insights and perspectives on how to position your brand and enable the user(s) to look at a positioning problem from every possible angle and therefore identify and evaluate every single positioning option available to their brand. A systematic exploration of these 26 triggers will 1. lead to more positioning ideas faster than any other methodology out there, 2. provide fresh insights and perspectives on how to position your brand and 3. enable the user to identify and evaluate every single positioning option available to a brand. Some have called the Positioning-Roulette Flashcards “The Creative Whack Pack of brand positioning and storytelling”. These cards will boost your strategic ability and brand storytelling IQ and are a must-have for anyone involved in creating positioning platforms and brand stories. The cards are already in their second edition. If you live in the US you can also order the cards through Amazon. If you live outside the US, order your cards here. “A great tool to help generate thoughts for branding or new product ideas”. Some have called the Positioning-Roulette Flashcards "The Creative Whack Pack of brand positioning and storytelling". These cards will boost your strategic ability and brand storytelling IQ and are a must-have for anyone involved in creating positioning platforms and brand stories. The cards are already in their second edition.